The Bungalow01568 770582work Self-cateringThe Bungalow is comfortable, warm, well–equipped and is ideal for relaxing, being situated in a large tranquil garden which is a haven for birds. 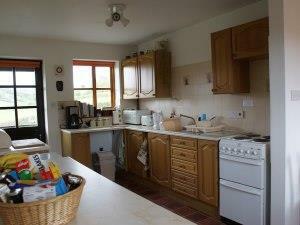 It enjoys delightful country views over unspoilt open countryside and forested slopes. The popular town of Ludlow, border attractions and Herefordshire are within easy reach of Lower Lye Bungalow. Make the most of local waymarked country walks and for keen walkers the Mortimer Trail. Rivers, churches, ruins, historic house, market towns and good food are all nearby. Freesat TV, linen, towels and electricity are included in the tariff. Children of all ages and pets are very welcome. Wheelchair access is available. From Leominster, follow the A44 signed Rhayader. After passing Morrison's upermarket, the A44 forks left, but carry on ahead onto B4529 signed Kingsland & Eardisland. After 1 1/4 miles, turn right onto B4360 to Kingsland. Turn right onto A4110. Pass through Aymestrey village, pass the Riverside Inn and take first left signed Lye/Lingen. Follow winding lane for 1 1/2 miles, pass a Black & White house and barns on the left, then take right fork. Sussex Acres is the first house on the left.